Anyone who was born before the ‘80s witnessed an era where things changed every two to three years. After 1990, however, India saw change like never before. And in the past 10 years, with the advent of technological disruptions, the changes in the business environments have been at a rapid pace. What hasn’t changed much, however, is the traditional, two-year full-time MBA that still comes with a fixed curriculum, loads of assignments and a promise to make students ‘industry-ready’. While regular workshops, live projects and seminars are also organised under the garb of ‘industry-academia interface’, these short-term steps aren’t helping. The industry is constantly complaining about how management students lack awareness and understanding of the real world. Anand David, director at SEEK and founder director of Manford, asks a pertinent question that most corporates have, “Do the professors at B-schools have the slightest clue of what their graduates go through in the first few years of corporate life? If yes, why is there a huge difference between what is taught and what it practiced in the corporate world? There is an urgent need to make management education more relevant. There should be deeper research on what organisations need, the pain areas, challenges, etc.” Though it’s a bold point of view that may rub a few people the wrong way, David is simply stating what corporates are facing with respect to new joinees. In the volatile business scenario of today, where companies are constantly innovating, how can B-schools rise to the occasion? Martha Desmond, chief human resource officer at Apollo Tyres, says, “Young leaders are required to adapt and react to situations that didn’t exist five to ten years ago. Management education should help future leaders in developing a creative mind to be able to design innovative solutions instead of searching for solutions from the past.” Her view is supported by B.V.R. Mohan Reddy, founder and executive chairman of Cyient, who says, “B-schools should create business leaders and not just employees. There is a need for leaders who can create businesses and manage their complexity. 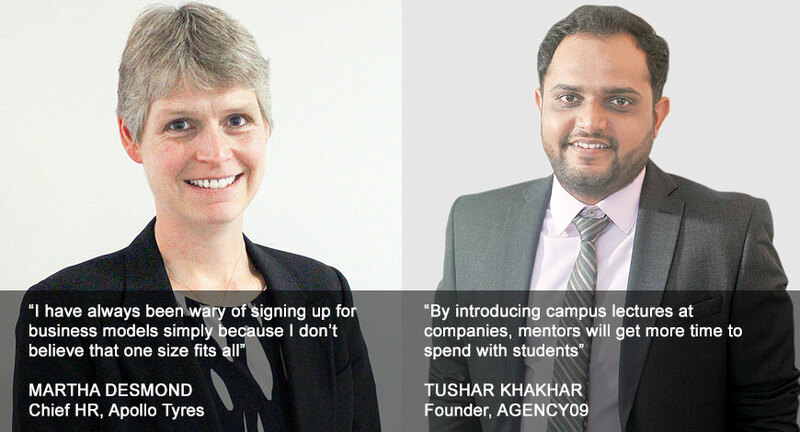 Students need to be trained to first become employable and then entrepreneurs. Our interactions show that academicians seem fully aware of the challenges that young business leaders are facing today. “Apart from the dynamic marketplace, demanding and highly-aware customers, and growth and proliferation of technology requiring constant change, some of the critical challenges that young business leaders face today are related to expectation management of stakeholders. Business models are increasingly getting derailed due to misplaced expectations from stakeholders — be it the shareholder/investors, vendors, distributors, customers, promoters or employees” says Vijayan Pankajakshan, dean HR, WeSchool. 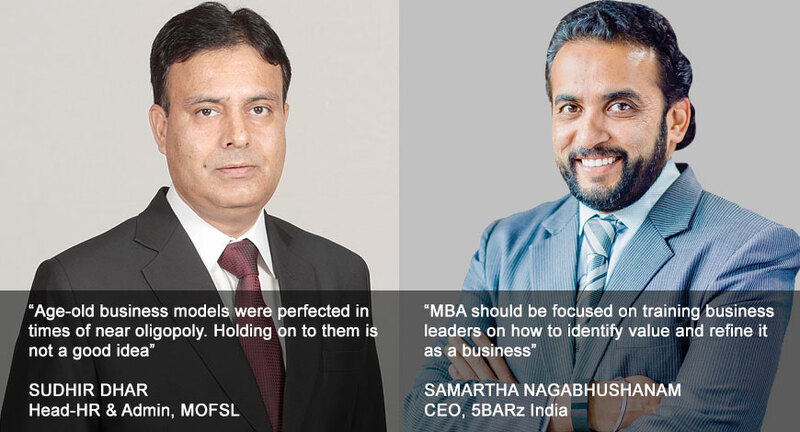 Sudhir Dhar, head HR & Admin, MOFSL, further adds, “B-schools need to understand that one-dimensional leaders are passé. This is the era of leaders who can work with different teams and yet add value in their operations and processes.” Sujit Jain, founder & managing director of Netsurf Communications, agrees. He says, “Going outside the purview of theory and case studies, management institutes need to impart education that gives real-life experience to students.” Adding to it Munjal says, “Various studies have shown that some of the highest paying jobs today didn’t exist a decade ago; therefore, management education needs to prepare students to be able to spot and capitalise on opportunities quickly. While the business scenario is volatile, students face the challenge of being part of a rudimentary system of education where rules and regulations restrict inclusion of the latest modules in the curriculum. “Young professionals are increasingly realising that their 18 years of formal education has left them grossly unprepared for the reality of today’s business. Every standard business model has been challenged, and the profit-motive has long given way to a drive for valuation and market share at all costs. How does an entrepreneur build a business model that puts customer acquisition and revenue traction above profitability, when his education has taught him the opposite? Management education is frankly a dinosaur in this context. We’ve been trying to create well-rounded employees, when every job in the market now needs specialists with sharp toolsets” confesses Nitin Putcha, CEO, ITM Group of Institutions. Deependra Jha, vice-chancellor at GD Goenka University, strongly believes that the way management education is dispensed must be changed. 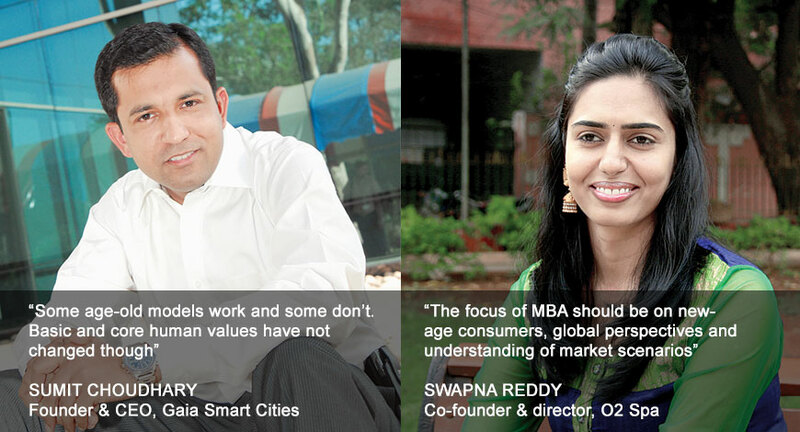 According to him, “B-schools definitely need to re-invent the management education process for a sustainable future. New-age subjects with qualified faculty must be introduced as part of the curriculum. Incase, a programme restricts addition of subjects, new courses can be offered as executive certificate programmes. Overall, B-schools must change the way they grade students. The focus should be more on what students can do than on the memory. Industry-academia collaboration is possible through internship exchange programmes.” Sandip Jha, chairman of Sandip University, supporting reinvention of management education, says, “B-schools must introduce a system of intelligent accountability at the administration and academic level. We need high-performing systems that build professional knowledge and capacity. This will create a culture of continuous improvement and high expectations.” Instead of overhauling management education, Ghosh believes it must adapt to the disruptive scenarios. He emphasises on taking positive steps to stay ahead of the curve. Nagabhushanam believes that educational content needs to be fast paced, and the curriculum should echo the needs in the next five years. Vardhaman suggests reinvention of pedagogical methods followed by B-schools, “The style of delivery of management education should shift to creative brainstorming to enable learners to understand current trends and develop new business models on the run. There is an urgent need to open minds to alternate ways of doing business.” Kaustubh Nande, country marketing head of ANSYS Software, agrees and suggests that management education should be more case-based with contemporary challenges around recent business issues. Desmond calls for a balance in the delivery systems and curriculum offered by B-schools. “I feel there is room within management education to have a broader offering that acknowledges the new but maintains the relevant elements of the old. Many renowned schools are already running highly creative leadership programmes that recognise the changes in the business context.” She further adds that it would be a mistake to move away from traditional management education too quickly as many of its concepts are still relevant today. We found that the industry believes that the curriculum and delivery of management education need change. According to Chowdhury, “Today’s management education relies on yesterday’s idea of organisational hierarchies and careers. Today, every company is part of a network that makes all policies and processes of a hierarchy irrelevant. Students need to learn how to manage in networked workforce across organisational boundaries.” Understanding team structures, developing a high emotional quotient, remaining calm and sharpening observation skills are most important. This calls for attitudinal training that needs to be woven into a curriculum structure. Swapna Reddy, co-founder and director at O2 Spa, on the other hand, speaks of a change in the programme framework where the focus shifts to new-age consumers, global perspectives and understanding of market scenarios. Jain of Netsurf believes, “Management education needs to be reoriented and a lot of skills such as humanities, strategy, environmental impact and digital media should be an integral part of the education irrespective of the discipline chosen.” Given that the curriculum and delivery systems followed by B-schools need to undergo a change. What does the industry feel about the age-old models? Is there a need to modify or discard traditional models? We found diverse views from the industry leaders on this. Nande agrees to this view, but Desmond has a different opinion. “I have always been wary of signing up for business models simply because I don’t believe that one size fits all. 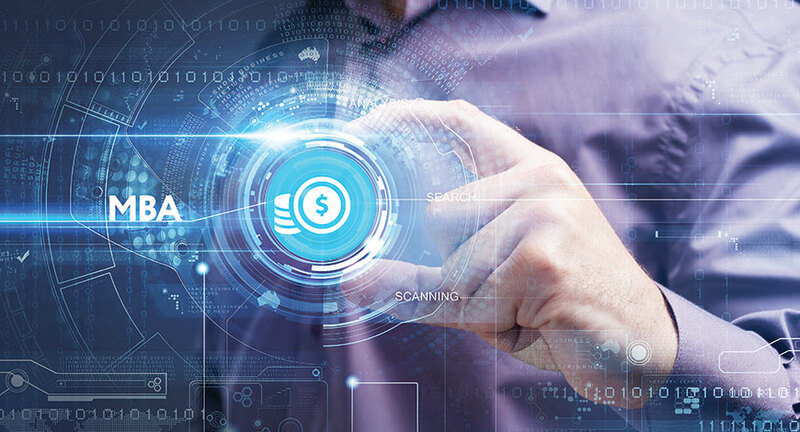 Age-old business models can be a very useful reference point, but in today’s fast changing scenario, it is possible that no business model will truly capture the requirements of today’s fast-changing world. We found that academicians largely agreed that the age-old business models need to be viewed keeping in mind the current context. While management institutes are responsible for training students, most agree that the training is not adequate. How do companies bridge this gap? Academicians call for a change in the internal systems of organisations by appealing to them to be more employee focused. All of us know that the disruptive times are bringing in changes that we have never seen before. There is no historical example that can be followed. However, if academicians and corporates work hand-in-hand the results will be phenomenal and long-lasting. While the responsibility of training surely lies with the B-schools, the content, delivery and pedagogy can always be influenced through corporate intervention. If industry involvement can be formalised using a time-value formula, corporations would surely be more involved in the training process at B-schools. And we will all march towards a better India.